Written by Janet Choi on April 21, 2016 . The clothing company Burberry was having an identity crisis. The 150-plus-year-old company was underperforming and seemed stodgy, all while trying to appeal to too many people. Burberry’s genius solution: implement a “brand czar.” The brand czar’s sole job was to regulate every consumer-facing part of the business. Everything from their product offerings, their brick-and-mortar stores to their online ordering system to their customer support scripts to their emails had to feel consistent. With the brand czar, consumers would walk away from every interaction, knowing that they dealt with Burberry, a luxury brand. It worked. The company transformed its brand, spurred growth, and affirmed its place in the luxury sector. This takes advantage of one of the most crucial elements of the familiarity principle: consistency. Sociologist Robert Zajonc, the first person to study the familiarity principle in a lab setting, discovered that the principle only works if few variables are changed between touchpoints. Humans like consistency. 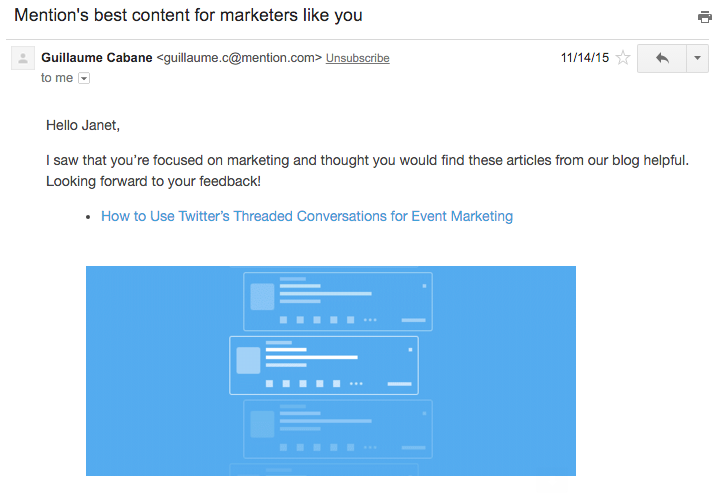 For users to connect with a consistent brand, there should be an identity that comes through each experience — and that includes how you talk to people in your emails. Second, there can’t be a “too many cooks” problem. 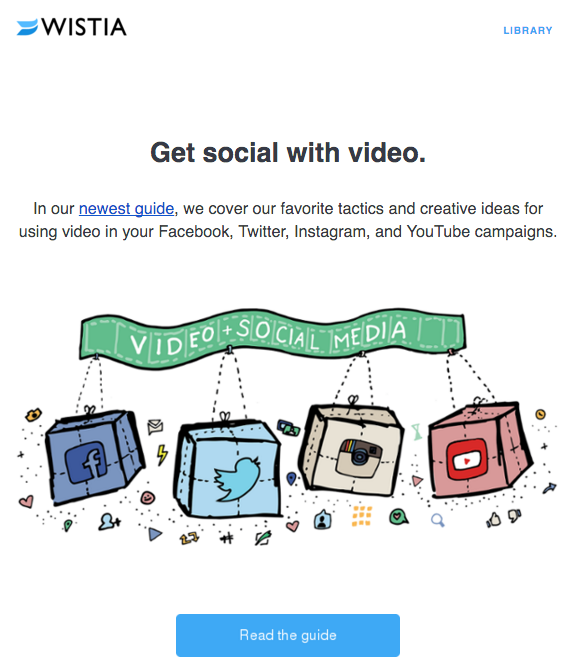 The experience should feel continuous, from your email headings to the copy and tone of your messages. Trello users sometimes get an email from an interesting address: taco@trello.com. 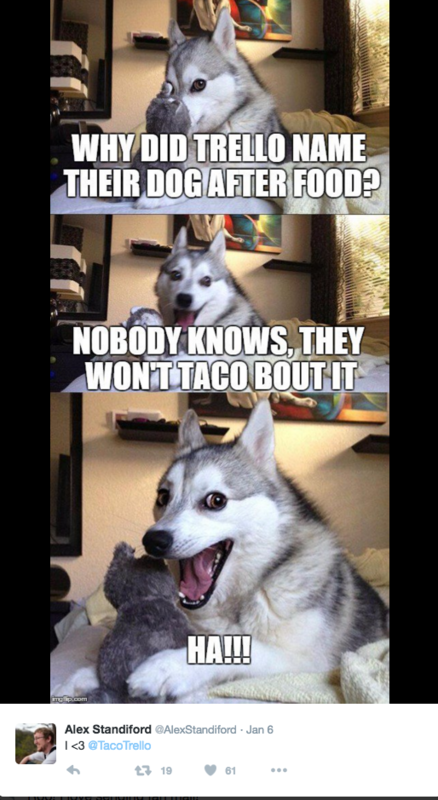 Taco the Husky is Trello’s mascot, a literal embodiment of a brand czar. 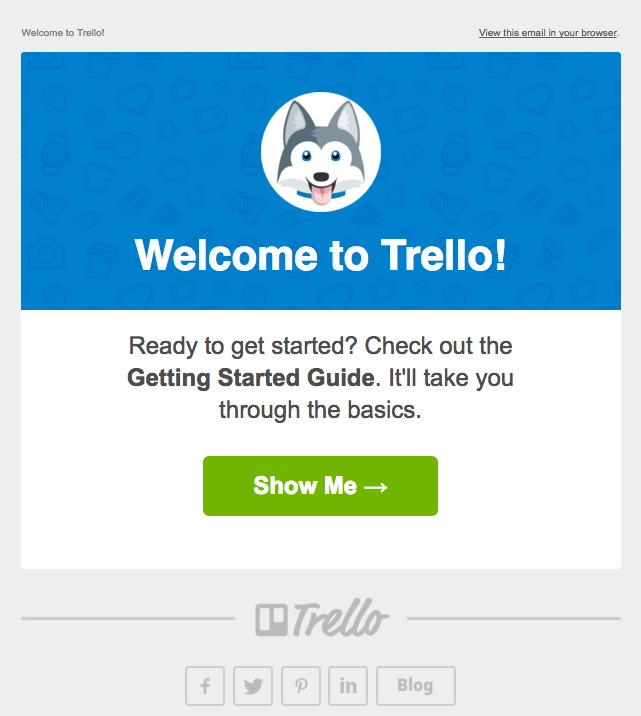 As the mascot for Trello, the dog “sends” emails too, including feature updates, news, and a helpful “how to get started” message. In addition, Taco has a Twitter account. It’s goofy, but it shows the brand’s personality and gets people to want to engage, instead of shoving touchpoints in their faces. A presence like Taco’s helps make the brand feel consistent over time, which is what the familiarity principle is really about. It’s not necessarily about having an actual person to latch onto but an identifiable presence that users can get to know and even engage with. To build a consistent presence with your emails, first, consider the elements that can become familiar to someone in their inbox — like design, tone, and having designated, identifiable senders. People feel safer opening an email from a friendly name, (like Janet from Customer.io) rather than a do-not-reply address. And as Kristen Craft, Wistia‘s director of business development, puts it, showing character is a great way of getting touchpoints that matter. Over time, the more people see this identifiable, positive presence, the more that identity will stick. You’re increasing trust and recipients’ inclination to open and pay attention to you, message-by-message. Political canvassers have a tough job. For every unsubscribe we might get, they get a literal door closing in their face. But recently, a team of researchers examined how going door-to-door can actually change people’s minds, even on really hot-button issues. The most effective canvassers don’t throw facts at people or present a laundry list of reasons to vote for this candidate or against a certain policy. The most effective canvassers tell stories. Specifically, they tell stories that really get the listener to empathize, and allow the listener to imagine what it would be like to be in that situation. As one study found, perspective-taking, or “imagining the world from another’s vantage point,” is a cognitive-active process that can have huge effects, from changing someone’s mind to even reducing prejudice. Branding these days can seem like it’s all about being catchy and viral, but it’s quality touchpoints like stories that connect with and involve people that stick around. 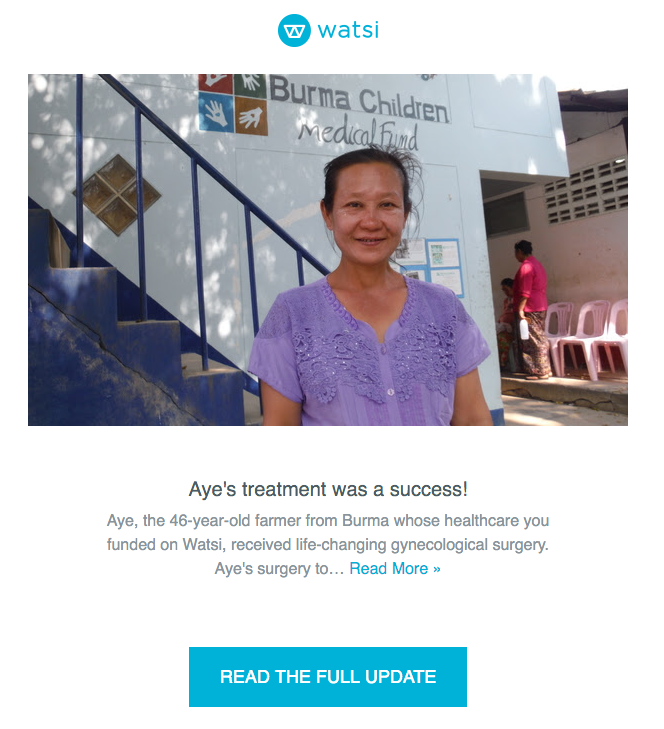 Watsi enables people to directly fund patients in need across the globe. The nonprofit saw the great impact of telling their patients’ individual stories, including updates on their treatment and beautiful photography, via email. For Watsi, this “user experience” has become an important part of their brand. It feels much different when you make a donation through Watsi than another organization. I love getting updates about patients whose treatment that I’ve helped fund. 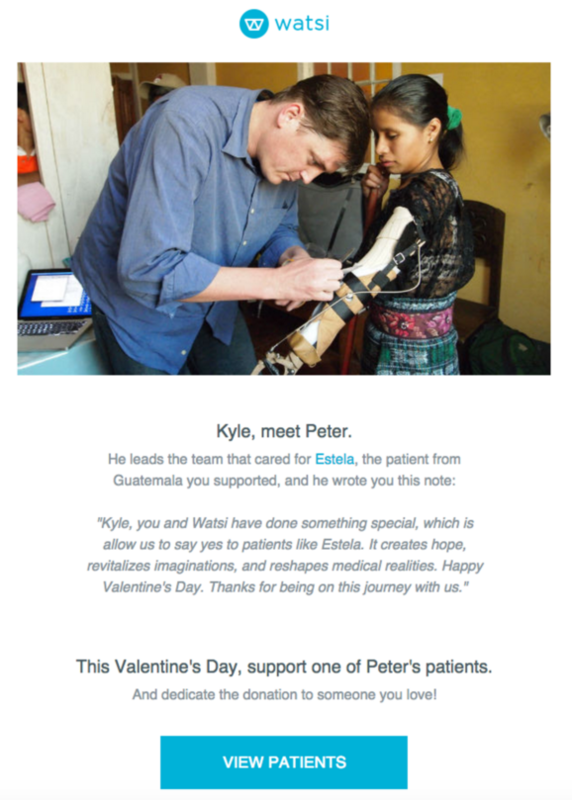 Instead of getting a receipt for my donation as if it were any other type of cold purchase, Watsi allows me to become more involved in the narrative, which accomplishes many things. I get to feel like a caring, informed person, which makes me think of Watsi in a positive light. I feel more engaged with their work, which makes me want to continue to engage with them and continue donating. And it aligns with the company’s main value of radical transparency, which creates a consistent experience. Here’s one of Wati’s best-performing email campaigns. The message is personalized based on a patient previously funded and brings in the perspective of the patient’s doctor, recalling the familiar and weaving a continuing narrative journey of support, care, and hope. “We realized the closer we can bring people to the work we’re doing on the ground — to the patient, to the hospital providing the care, to the person’s family — the more they will feel like they are having a signficant interaction, and that’s the product we deliver for every donation,” co-founder Grace Garey told First Round. One big common mistake is abandoning your audience and customers too early, before making a lasting positive impression, or even before they even know who you are (which is why sending the odd blast email to everyone at once can seem so terrifying). That requires more than just showing up to push a holiday promotion to drive sales or random news blast to drive traffic. For marketers, this means investing in interactions that are more than strictly transactional. Another huge mistake is that you grab the wrong takeaway from the familiarity principle — to win, talk more. That’s the fast track to acting like an annoying spammer, barraging your recipients with empty, impersonal messages. So your job isn’t done after one more signup or subscription — nor is it done by adding yet one more piece of noise to mix. Your job’s done when your brand comes off more like Coke than Pepsi. And when it comes to email marketing, one way to do that is by doing some good. 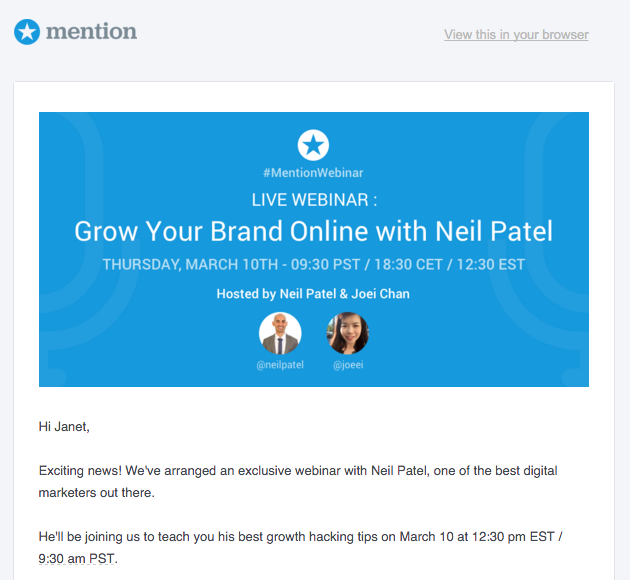 click to see full email to relevant webinars: By continuing to engage users even after signup — and personalizing content to make sure it’s relevant and useful — Mention is building a familiarity that matters. The familiarity principle seems like a bunch of common sense. 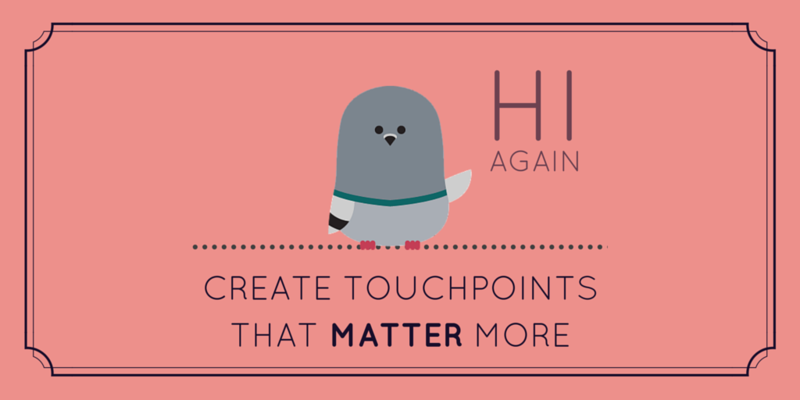 Repeat positive interactions — get happier audiences and customers — and ultimately, happier business results. But there’s still one profound lesson we haven’t talked about yet: the fact that how you communicate with people changes their experiences and perceptions of your product. Positive contextual associations that you create have an ability — on a neurological level — to affect someone’s enjoyment of your offering, over someone else’s. The potential for your customer communication and email marketing to make that difference is enormous. Data allows you to get even more personalized and relevant to your customers. Combine that data with a consistent voice and branding, great storytelling that brings people closer, plus valuable, helpful content — and you’ll supercharge your marketing. What’s another company that you think does a great job of branding and customer communication?